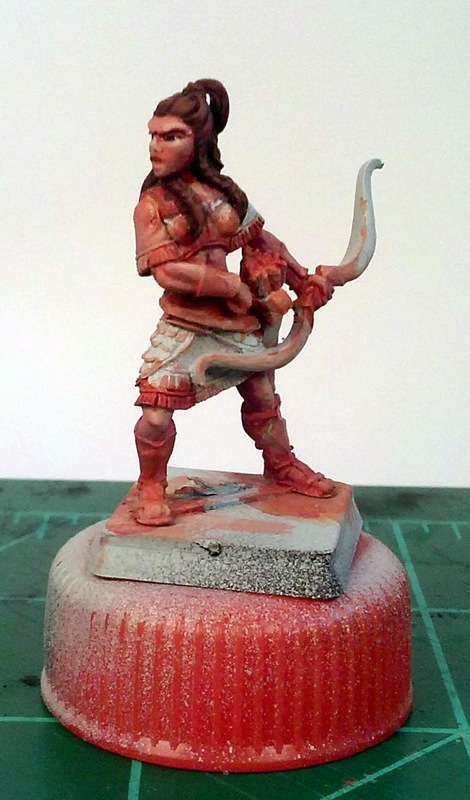 I have been doing a lot of AWI reading and then looking online at AWI miniatures. 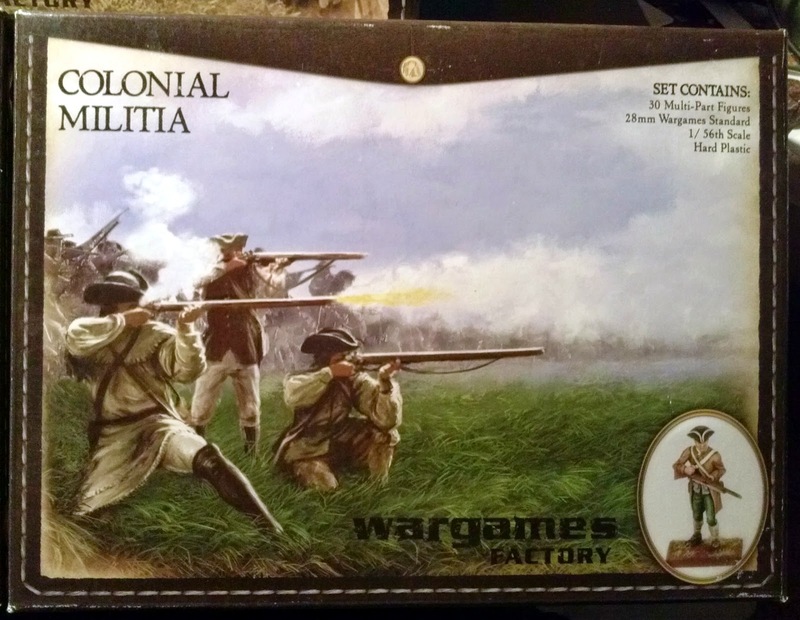 I decided to do something a little different and see how the Wargames Factory Continental Militia would build up. 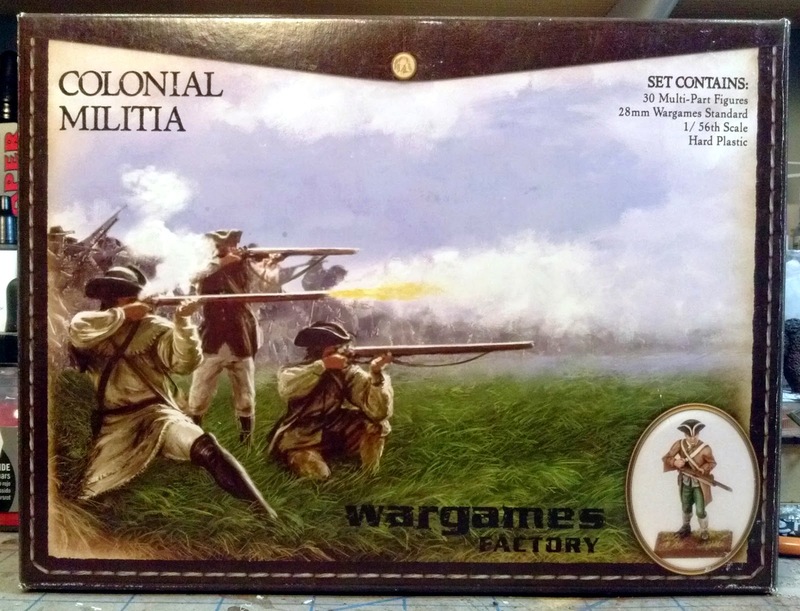 My first experience with Wargames Factory was their original Zulus and British Colonials, not particularly stellar models by any means. However, its been a long time and a full change in ownership since then. They have certainly come a long way. I found these very easy to build and they look pretty good as well. My quick pictures don't really do them justice. I changed out the blade in my x-acto knife and went to work. A sharp blade is a necessity when working with plastic so don't skimp on this. 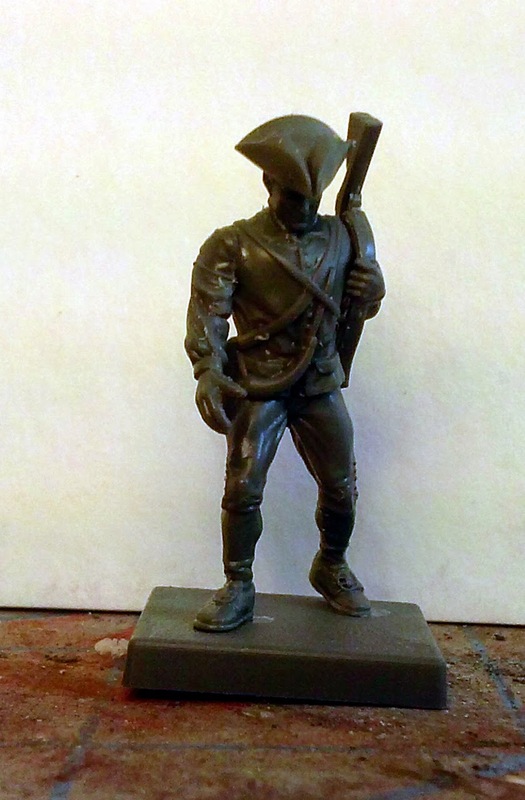 I opted to build one sprue's worth of miniatures so for the Continental Militia that would be 10 models. The instructions are pretty good remembering that arms that share the same alpha numeric code go together and of course that alpha code will match the body (example there are two arms labeled E1, one left handed and one right handed and they fit to body E as a matched pair). 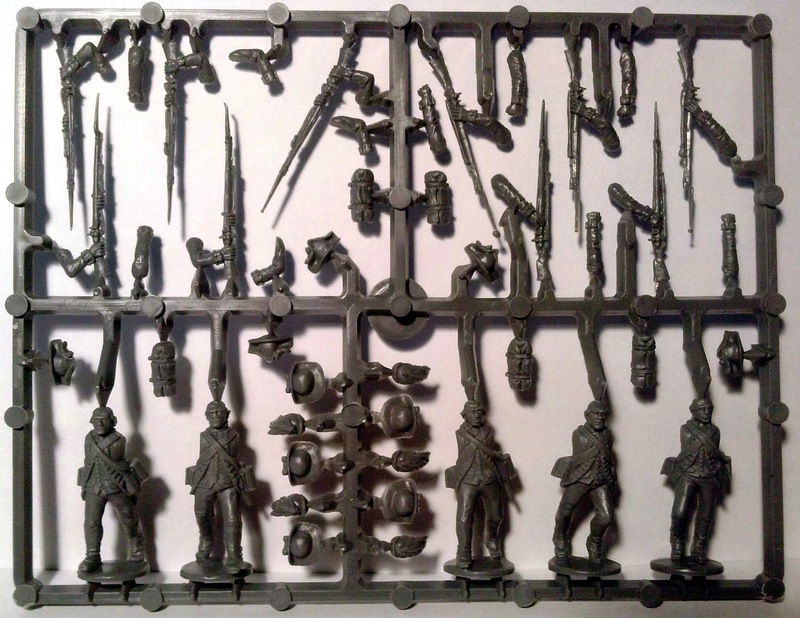 First mistake of the evening, I cut all the bodies from the sprue so I could clean up the mold lines all at once (mold lines are typical for injected molded plastic and is easily removed with the edge of the blade with a scraping motion, avoid the use of files). Once I had all the bodies cut off and cleaned up I realized that I didn't really know which ones where which. 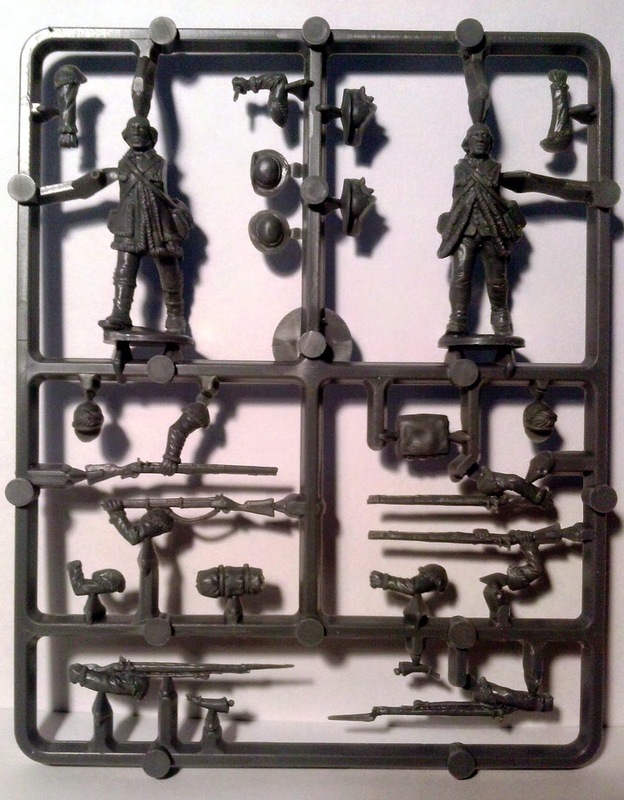 I found myself referring to both the instructions and one of the other sprues to verify that I was working with the right body. Just following the alpha numeric sequence will build up ten models pretty quickly. 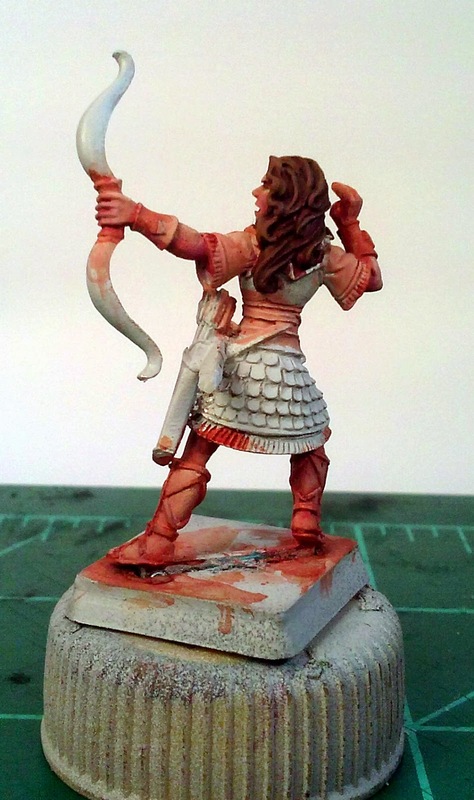 Now some of the arms are interchangeable, what I didn't check is if they matched the model's uniform or not. The hunting shirts aren't an issue but the civilian clothes might be. 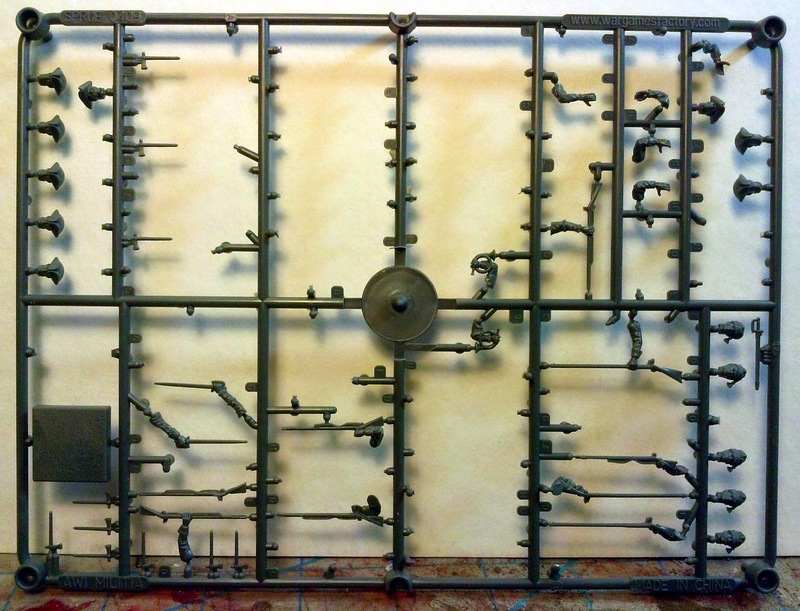 I would recommend building up one of the three sprues according to the directions as they are written. 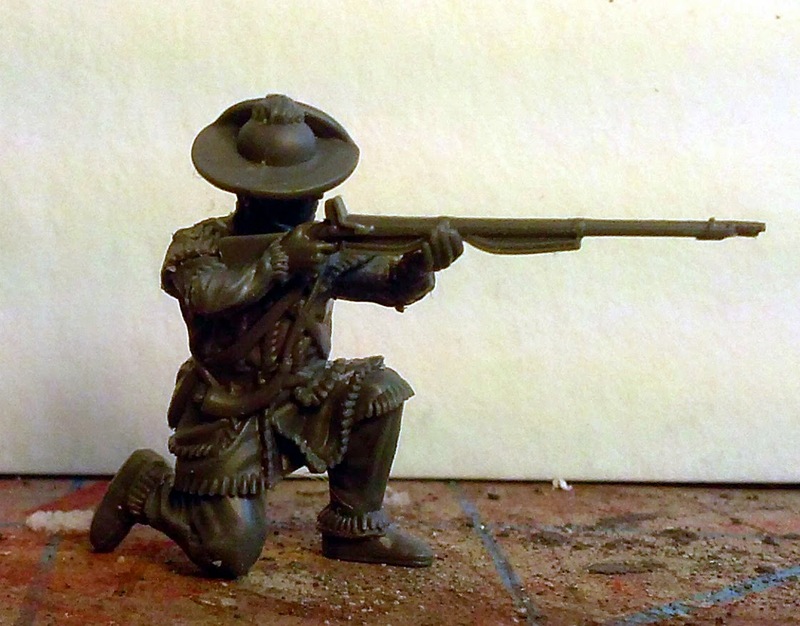 Most of the arm variations simply are giving you a choice between giving the model a musket or a rifle. 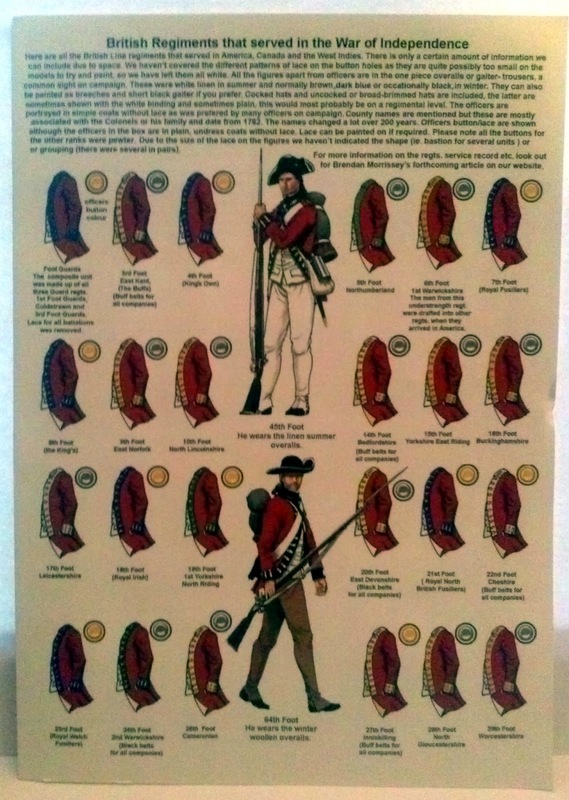 You have a choice of heads wearing the round hat, the tricorn or the soft cap. They all have the same expression. While I understand why they did this I don't think it would have taken much effort to work in some facial expressions. 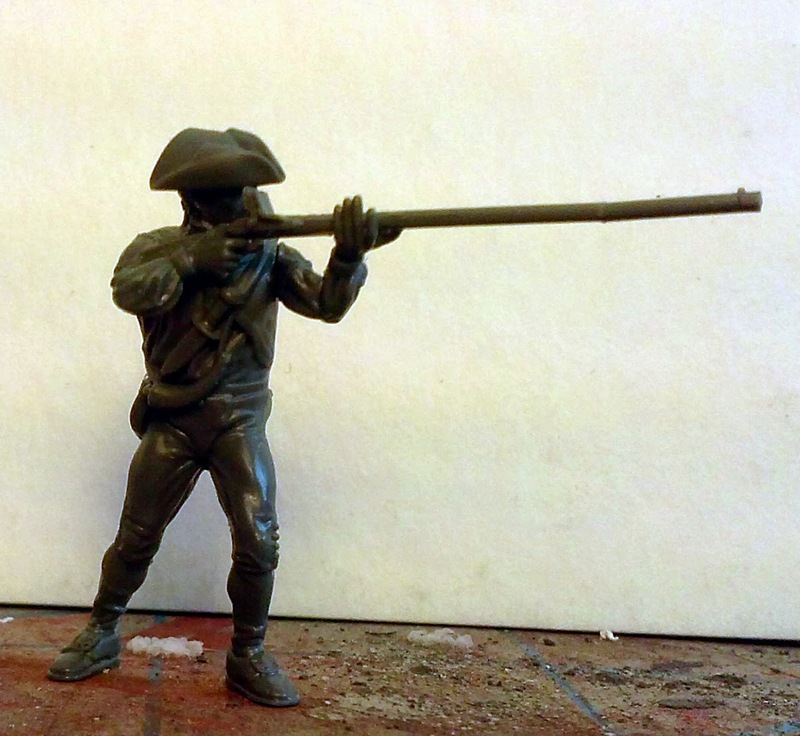 I'm not fond of the tricorn simply because it looks a little odd when seen from above because of the way its molded. The one issue I have is that the attachment point for the head is ill defined at best and because of the slope all of them will have a slightly head down look to them when looking straight ahead. 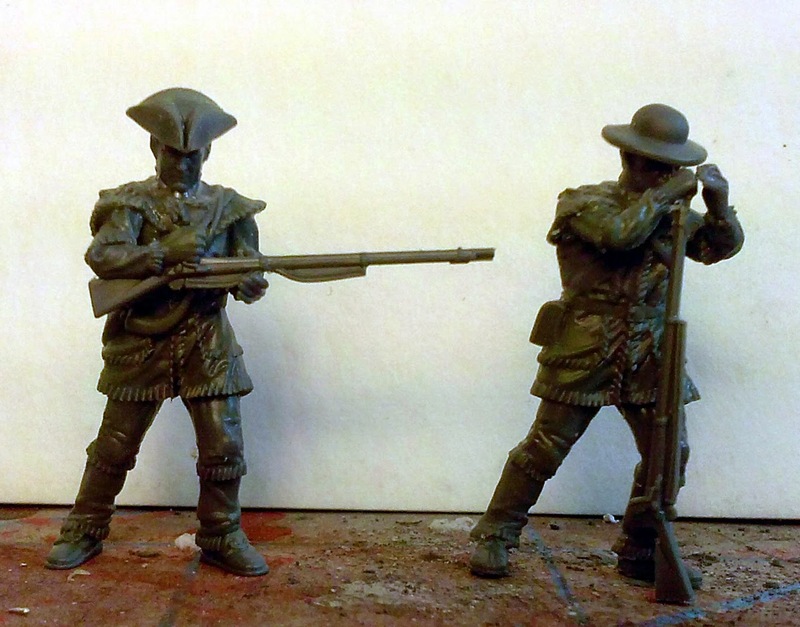 When they are in a firing position it looks fine as it looks like the model is looking down their musket or rifle. 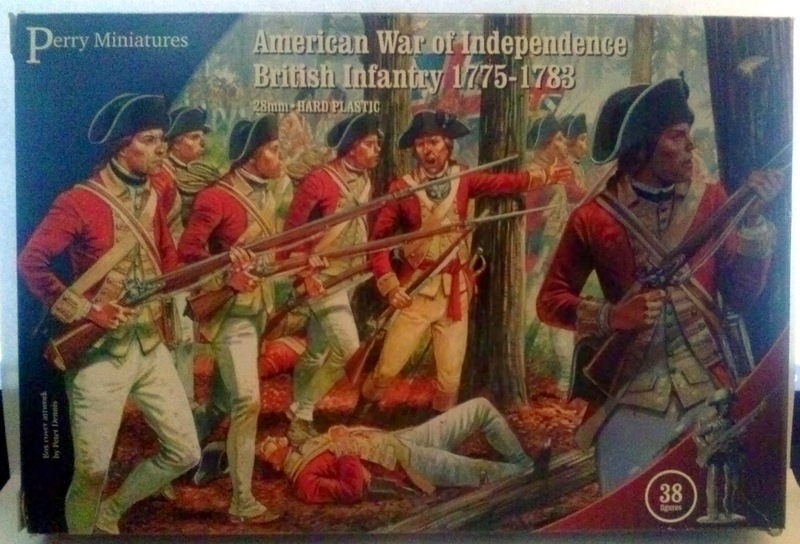 I would like to purchase some Fife and Drum miniatures and get a feel for how they will fit in with the Wargames Factory models. See if I can mix them or if they need to be in different units. Here are some pictures of the results of the building process. The box, although I really should have taken a picture of the back and not the front. 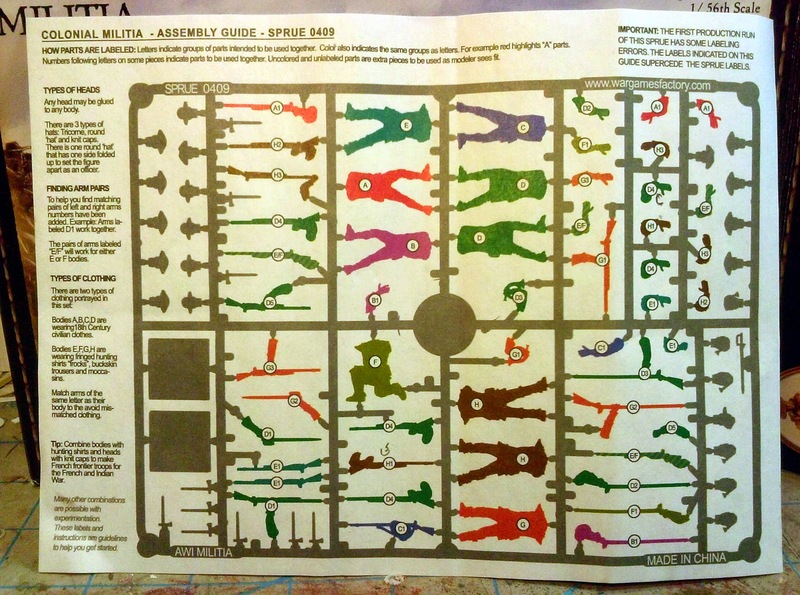 The instruction sheet. I'm making notes on this as I go. 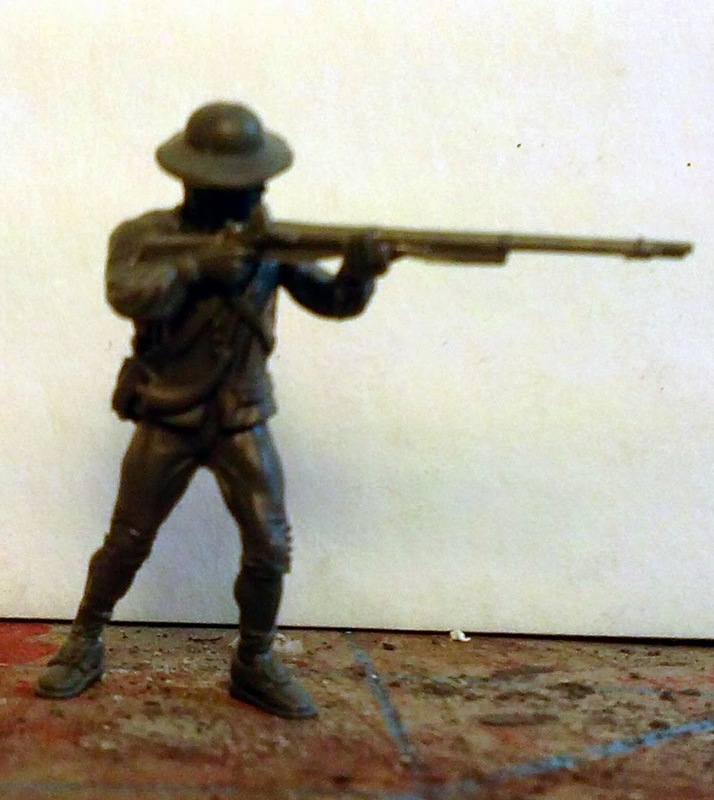 Body B, standing and firing. While I'm carefully cutting I did manage to break this gun barrel. It bothers me enough that I'll go in and replace the whole right arm. Body A, standing and firing. Body E, cocking. Note that the right arm in this case is not an "E" arm but an "H" arm. Body G. Note the head down position created by the slope of the shoulders. 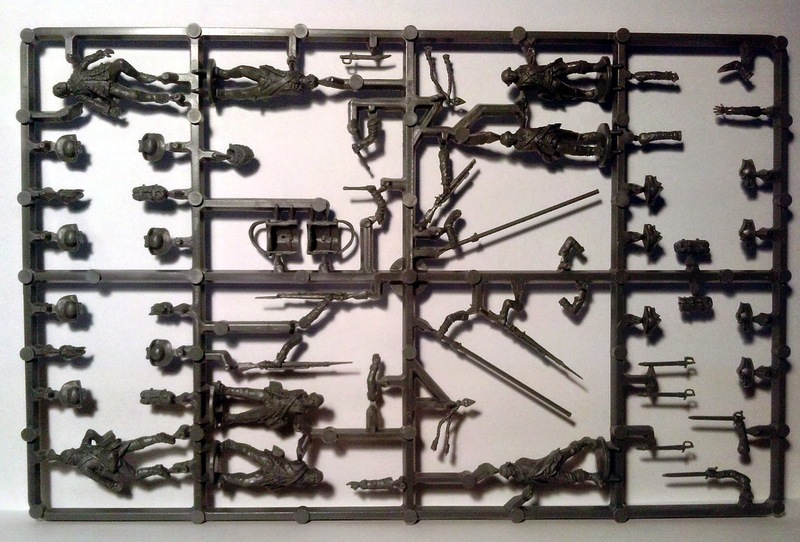 Body D, again there are two of these on the sprue. I went with the knit cap on the model on the right because I used all the round hat heads. Body C, again note the head down look. 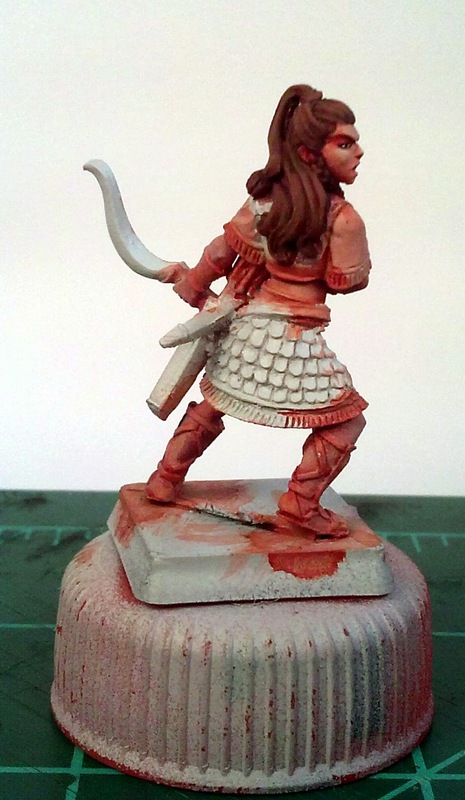 I tacked this one to a base since it wouldn't stand on its own. There are still a lot of pieces on there, lots of arms and heads. There are not a lot of accouterments options but that's okay with me. Fewer pieces to get broken or broken off. I built these pretty much straight from the instructions. I was a little frustrated with Body E because I was trying to build the version shown on the back of the package which you can't actually do with the "E" arms. That's when I figured out that the arms are more interchangeable than the instructions allude to although the box states that the arms are interchangeable. It was nice to learn that for a fact. Over the course of the last week or so the rest of the AWI books arrived. I ordered these based on recommendations on TMP. I have flipped through them and there are some nice illustrations and color plates in both books. I'm sure they will be quite useful. 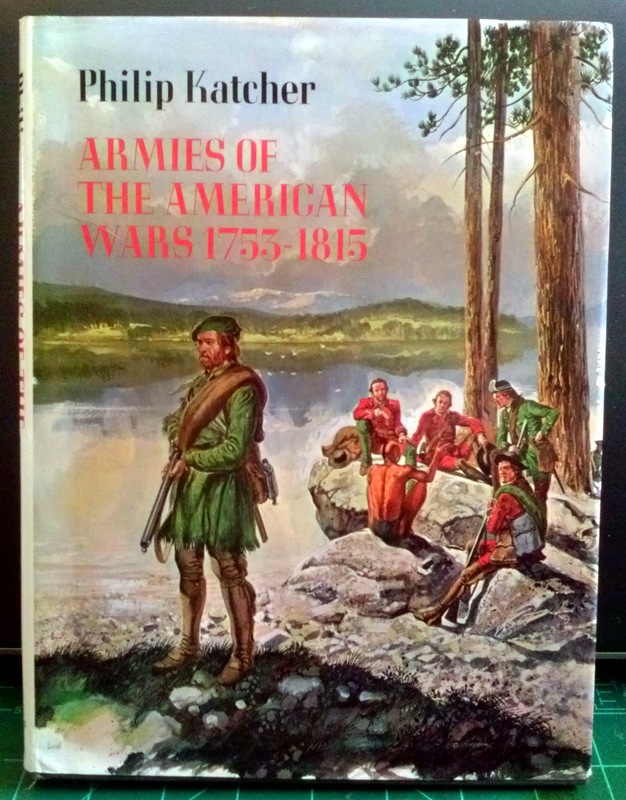 One of the previous uniform books (The Illustrated Of Uniforms From 1775 -1783; The American Revolutionary War) I picked up is apparently "riddled with inaccuracies" and is to be avoided. I seriously doubt if the "errors" are significant enough to actually worry about but I am considering trying to cross index uniform descriptions between the different sources and see where there may be actual disagreement on the facts as they are known. 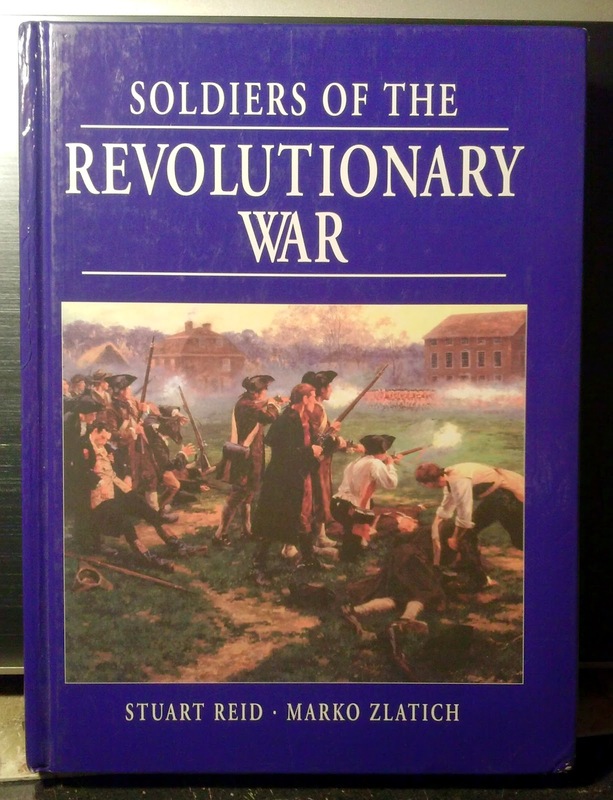 Of the three, I'm told, that the Soldiers of the Revolutionary War is based on original research as opposed to the rest that tend to reference back to Lefferts. Once more into the Breach! 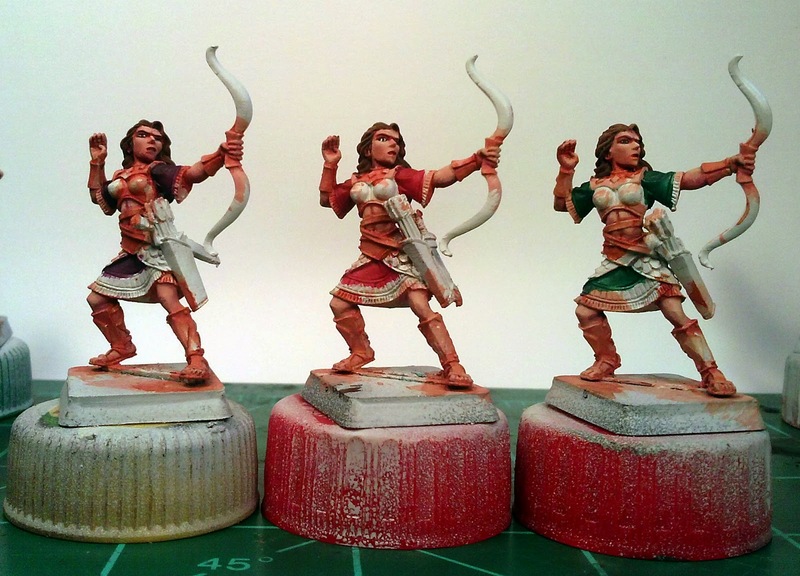 I set aside my competition entries for a bit and did a little more work on the Amazon archers. 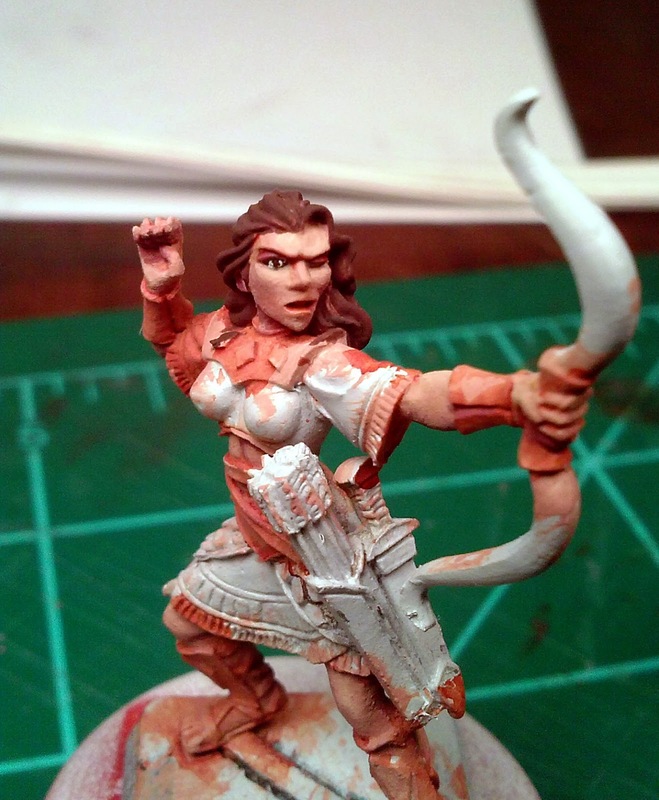 I finished off the skin tones (there is still some work to be done but that can wait) and moved on to the hair. I decided to go with dark brunettes for this, while "historically" the area produced mostly black hair I wanted something lighter for this. 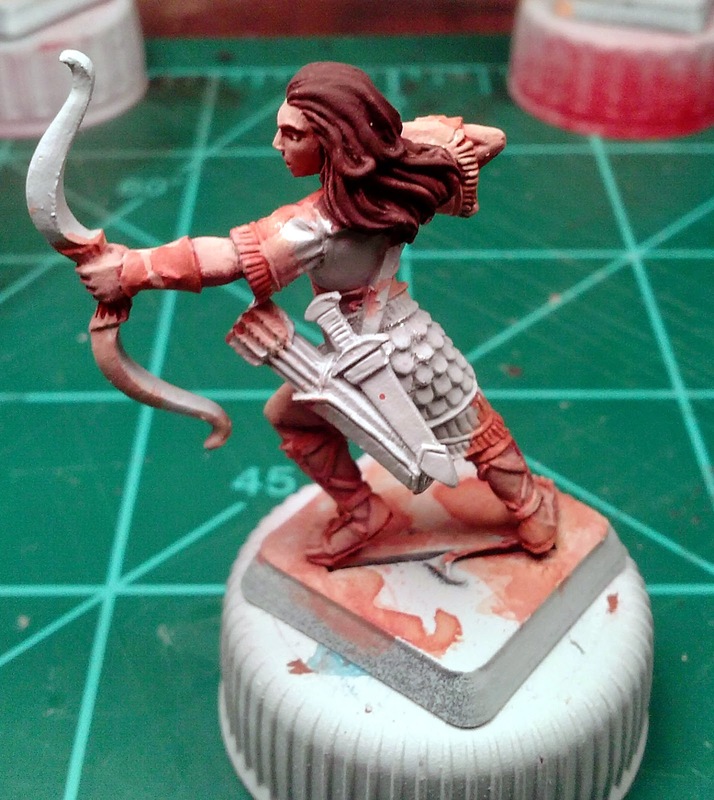 Fitz seems to spend a lot of time sculpting hair and I wanted to go a little farther than I normally would for a tabletop army. These are becoming a real time sink! I finished the hair though (I could probably do some more highlighting, I'll think on that) and decided to start blocking in the colors for the cloth. I'm starting off with a deep purple, red and green. I wanted to add some variety this way, since almost everything else is going to be a leather of one color or another. I think these will work. Pictures (I know, or it didn't happen). I didn't have my grey background with me so these are a bit washed out. 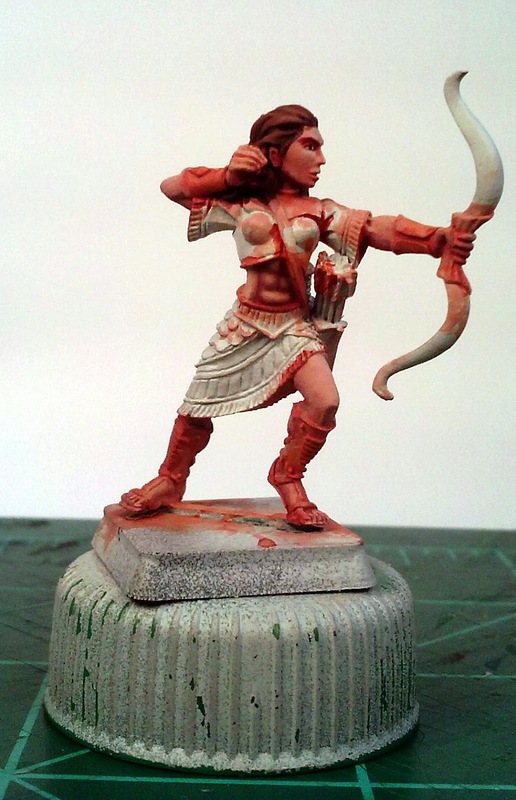 Archer Type 1/ This is where I ended with the skin. There is still some work to do on the face, like the lips and mouth but I needed a break from the face. That's a lot of skin! 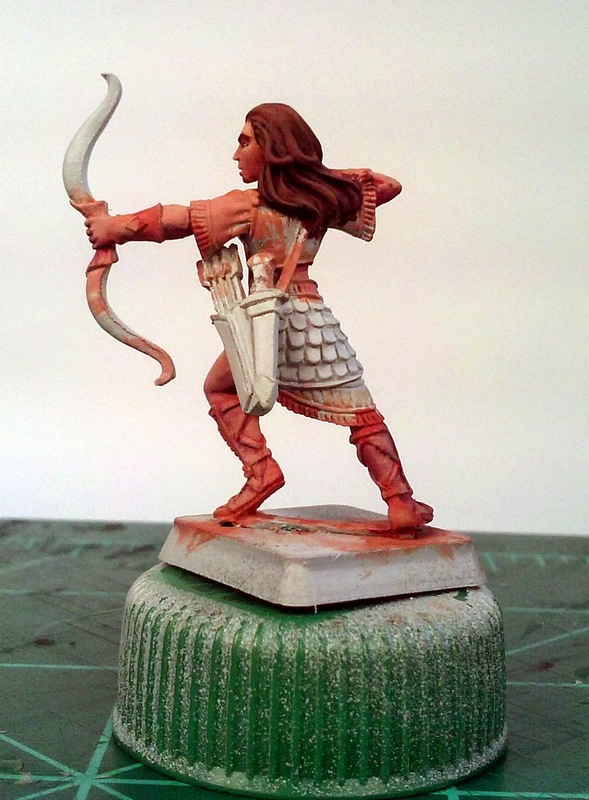 Archer Type 3: Hair is pretty much finished at this point. Maybe some additional highlights later. 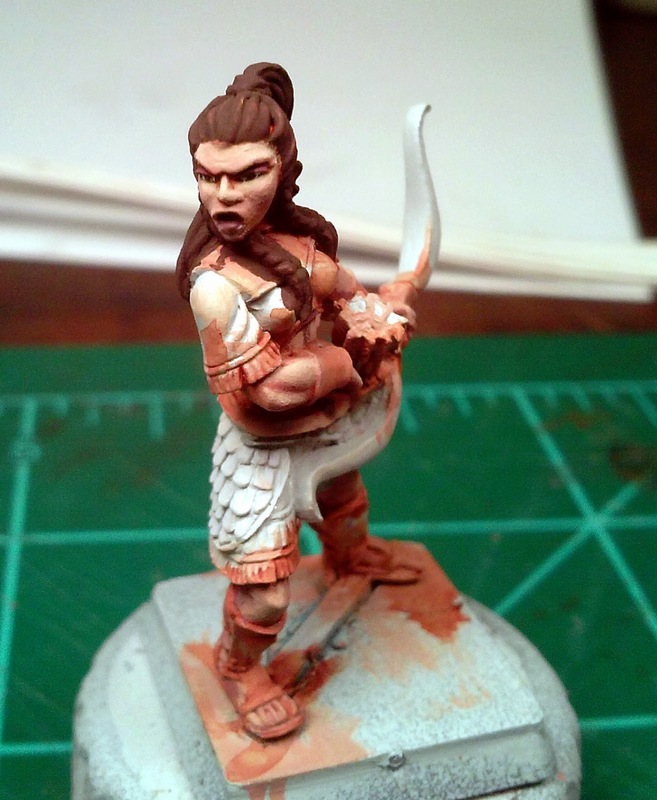 Blocking in the dress colors. From left to right: Reaper MSP 9664 Carnival Purple (an LE color), Reaper MSP 9663 Big Top Red (another LE color), and Reaper MSP 9226 Peacock Green. I'm not quite sure where I'm going to go with the rest of that right now. 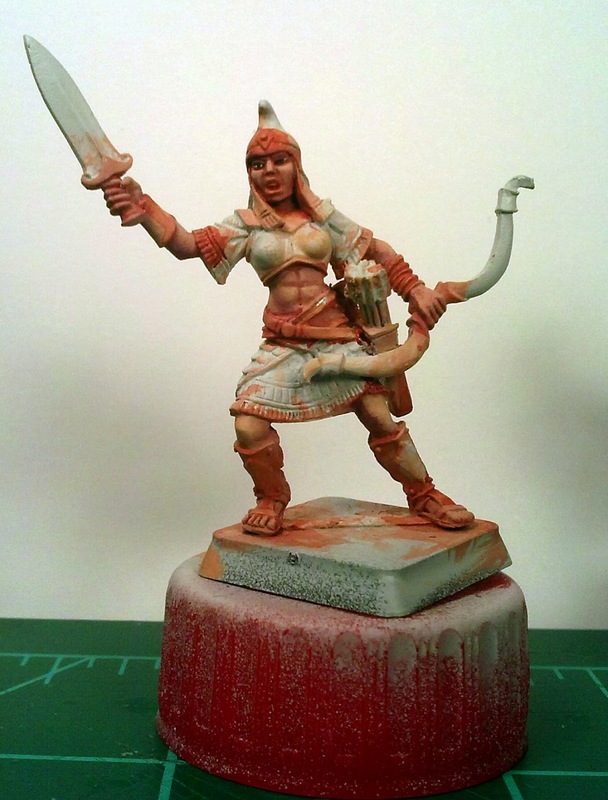 Genghis Con XXXVI is all wrapped up, I'm waiting to get the pictures of the winning entries and I'll post some of them here. During the course of the weekend a few more bits for the AWI project arrived. 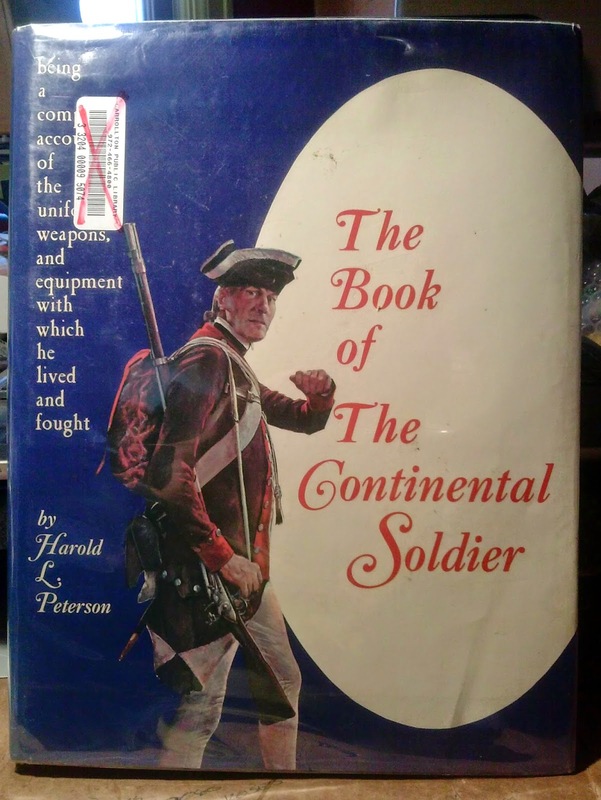 A book by Harold Peterson; The Book of the Continental Soldier, 1968, which focuses on the equipment of the soldier, along with some uniform styles and organization. 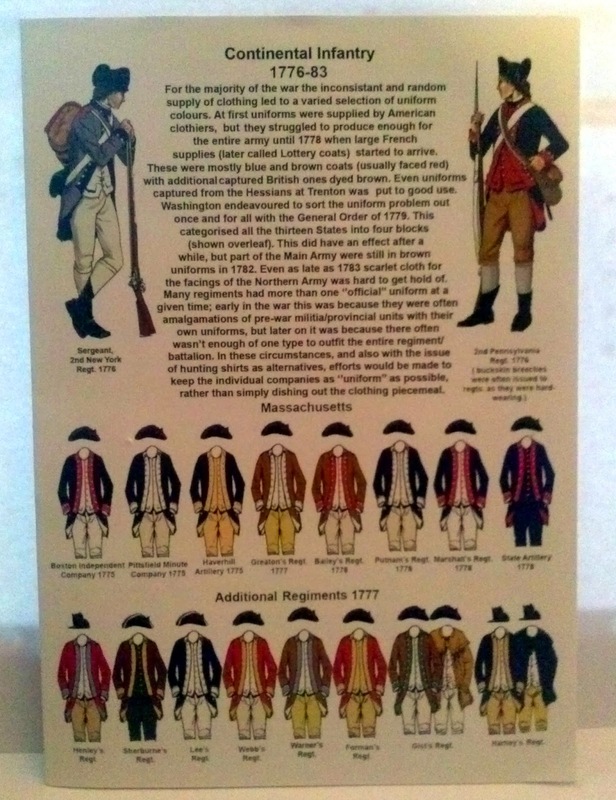 No color plates but an interesting guide to equipment and how it was worn. 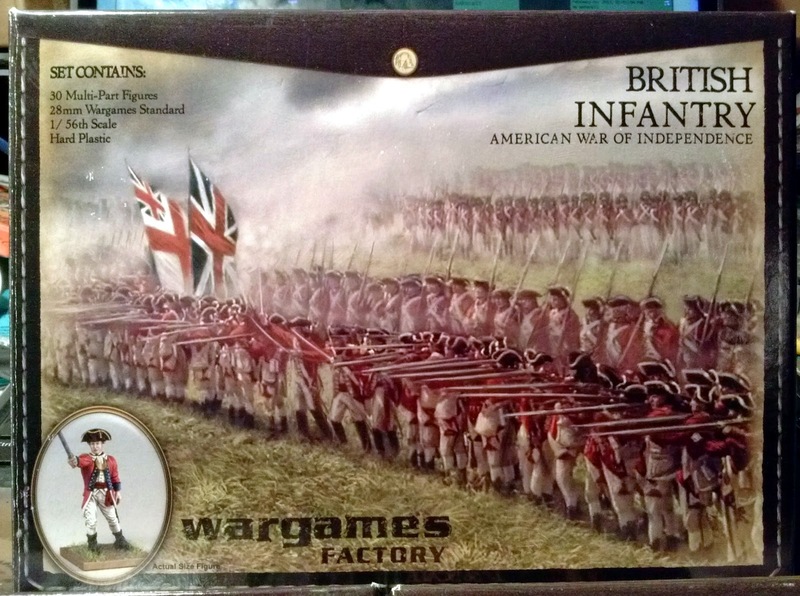 In a separate package from Brookhurst hobbies were a box of Perry Miniature plastic Continentals and a box of Perry Miniature plastic British. 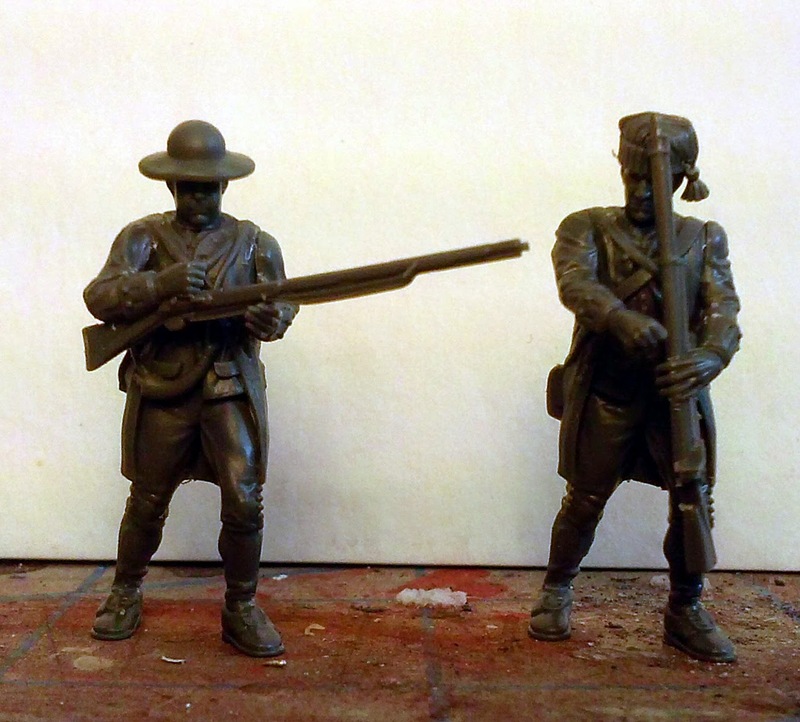 I did a quick comparison between these and Wargames Factory and at least at first glance Wargames Factory look to be a tad bit bigger than the Perry. I'll get a better idea of size once I have assembled a few of them. 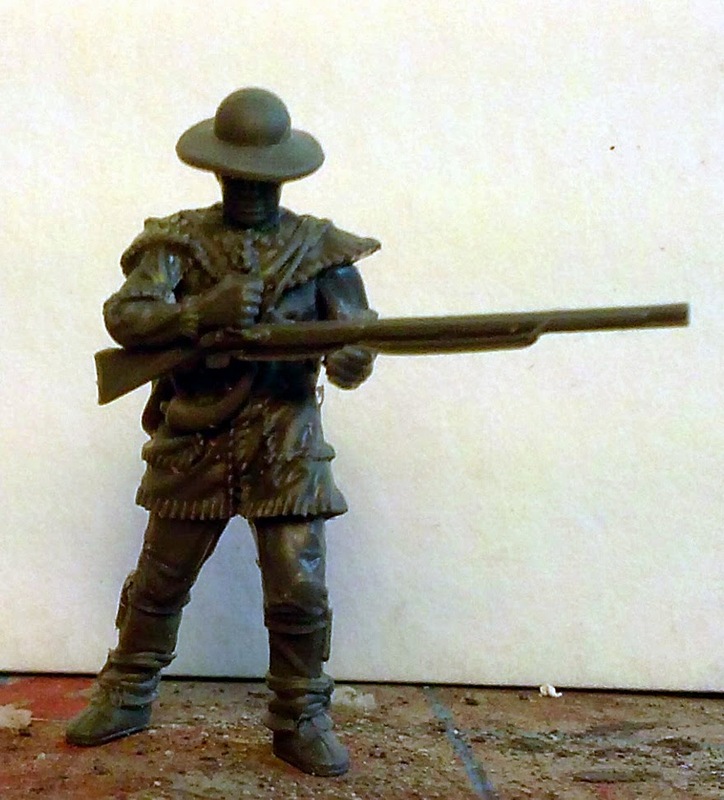 The Perry Continentals come with 6 sprues of Infantry (5 men per sprue), 2 sprues of Rifleman (2 men per sprue) and a Command Sprue (4 dedicated command minis). 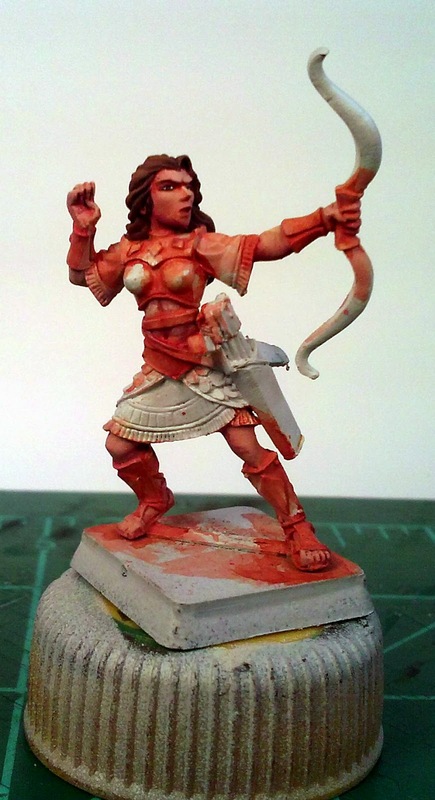 There are parts to convert two additional miniatures to go with the command group. 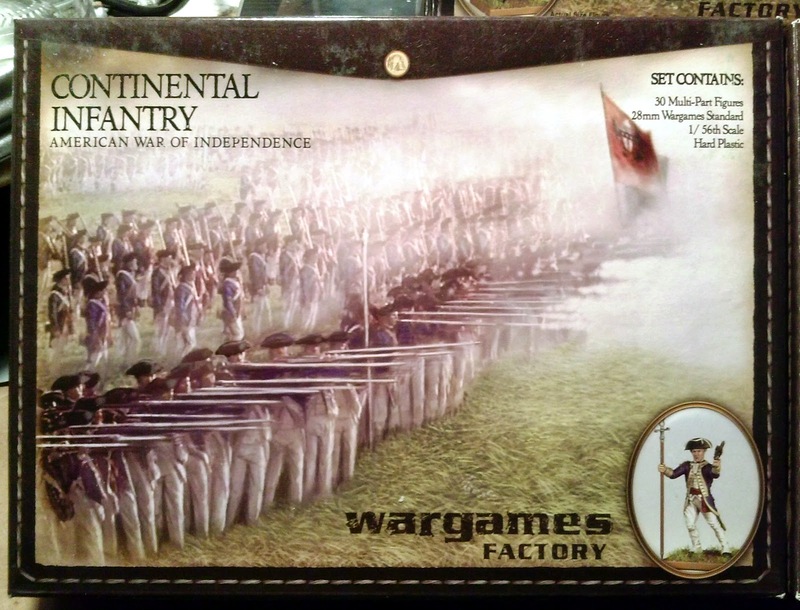 That gives you 38 miniatures in the box, 8 more than the Wargames Factory box. 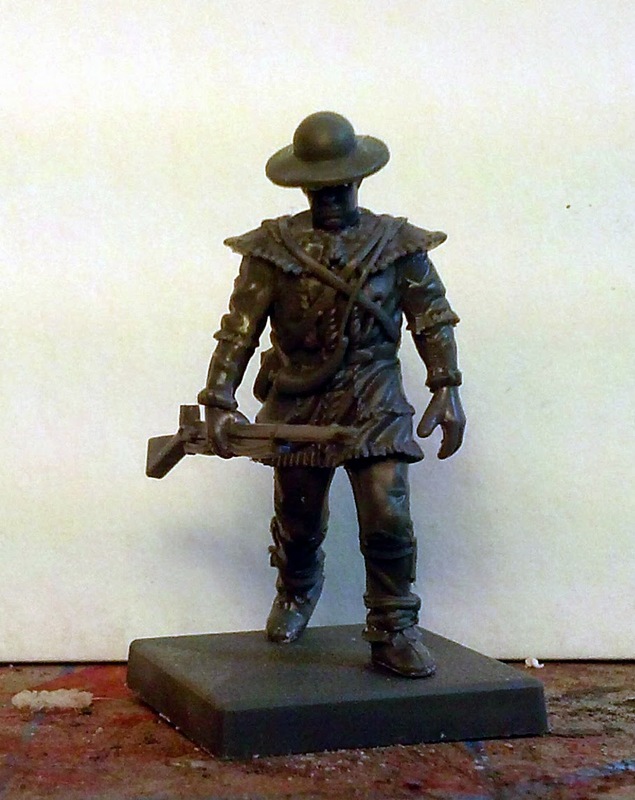 That makes me lean more towards using the Perry Miniatures for most of my units but I won't decide till some assembly has been done. 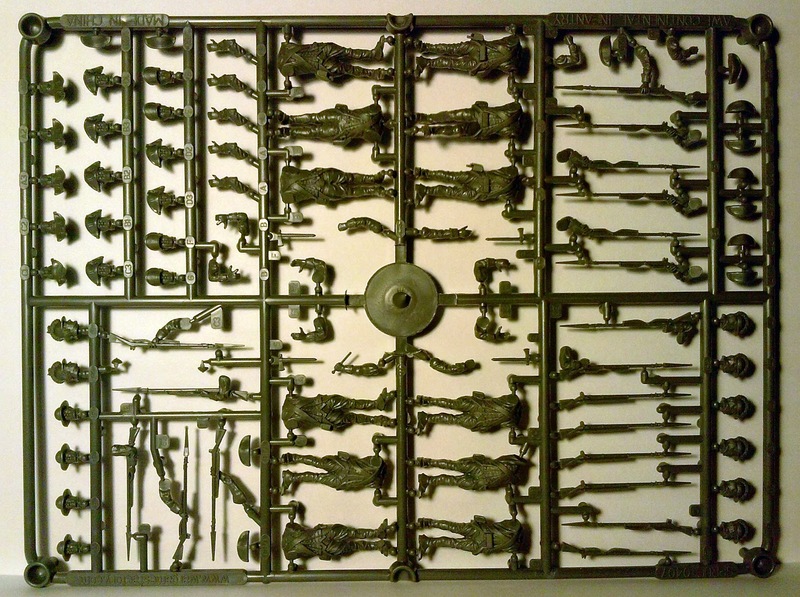 The British box has 6 Infantry Sprues (5 men per sprue) and 1 Command Sprue (8 men) but on the command sprue two of the minis are casualties which really only leaves 36 useful miniatures for a unit. Again still more minis than in the Wargames Factory Box. 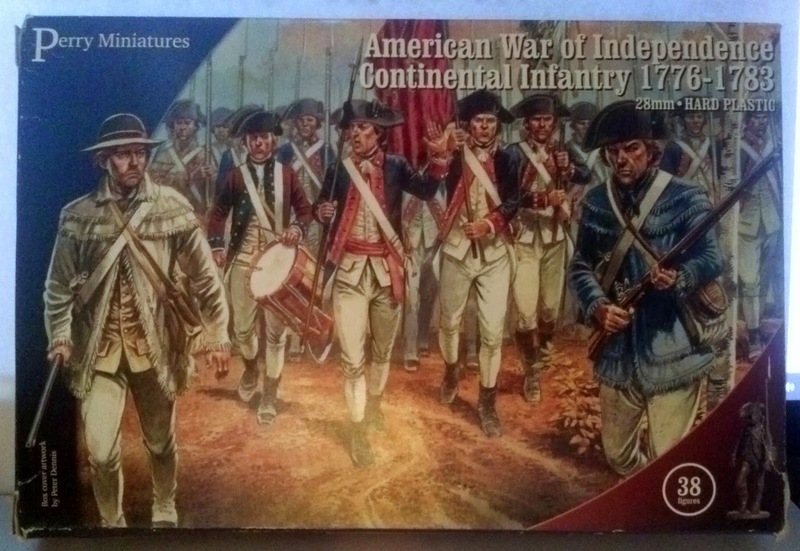 In adddition to the minis the Perry boxes come with some very useful uniform guides and the one for the Continentals is quite extensive. I'll be crossing check with other sources but on the surface it appears to be an excellent resource. So here are a few pictures for those of you who are a bit more visually oriented. I picked this one up used for a good price. Its an ex-library book and in really nice condition. Labels: 28mm AWI, AWI Plastic Miniatures, Perry Miniatures, The Book of the Continental Soldier. 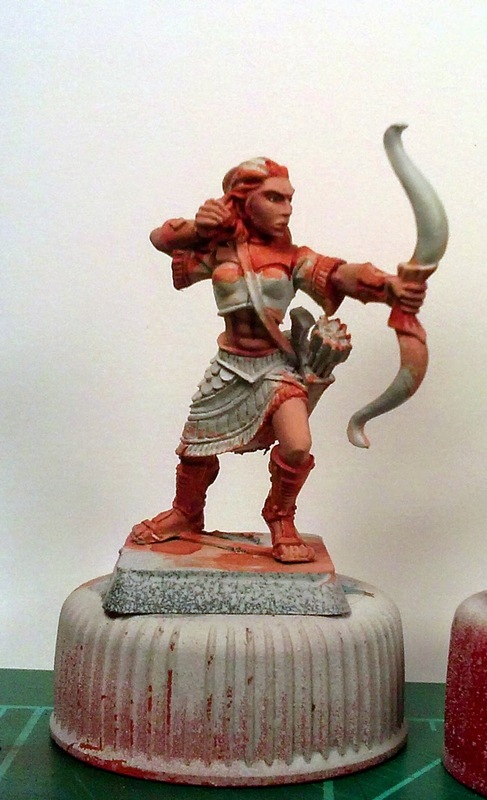 This is the weekend for the big local convention; Genghis Con XXXVI. 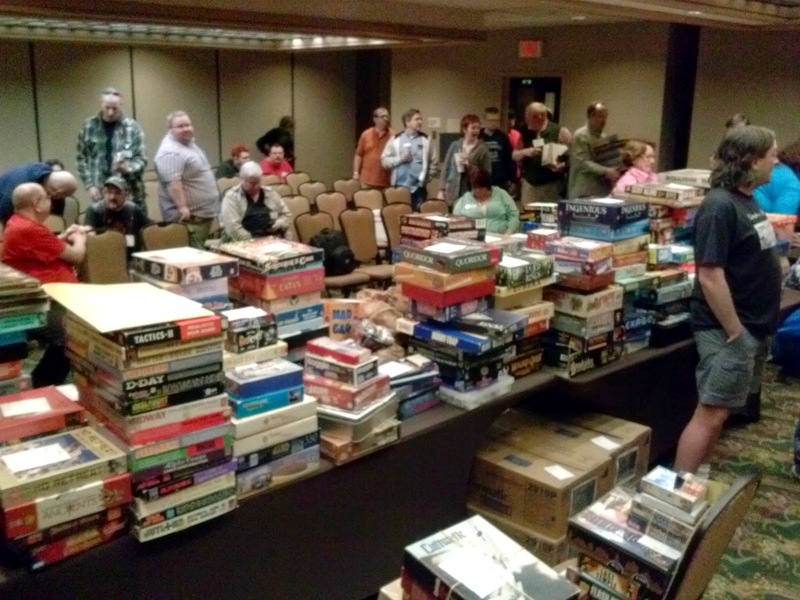 Friday night is auction night and my time to get up in front of a crowd and make them buy used games. I really enjoy doing this and I have been doing it for 30 years now. 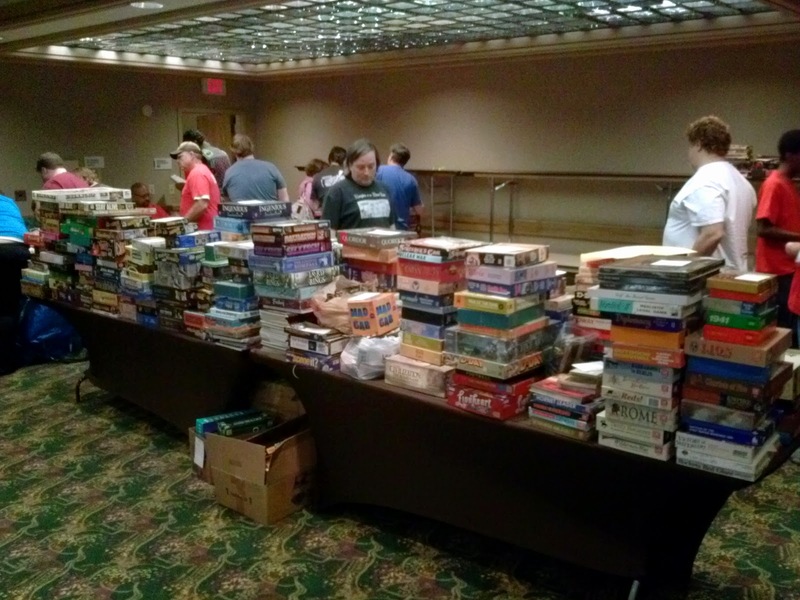 Here are a couple of pictures from the early stages of games being brought in to sell at the auction. We started selling at 6pm and finished about 12:30am and wrapped up the paperwork about 1:30am. Its a long night and I trade of duties with 2 other auctioneers although I lost one of them part way through the evening, I may have sold him. So I did the bulk of the selling. The high point, this year was selling an unpunched copy of SPI's Campaign for North Africa for $250. That's always fun! Looking forward towards the crowd. We opened up the air wall when it was closer to the start time. Looking towards the back. We stack the sold lots on the double stacks of tables along the back and side walls. Well after my grumpy blast about my painting block it looks like some retail therapy may have been the cure. Two books and three boxes of minis for my AWI project (although its hard to call it a project just yet) arrived yesterday, courtesy of the War Store and Amazon. Everything just received a quick glance at this point. 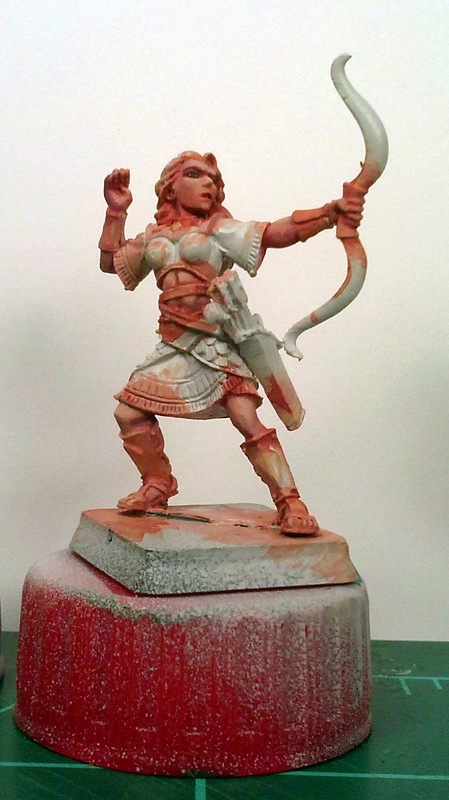 I spent the evening over at Genghis Con helping to man the painting room and I probably won't have time for a good look at these till Monday. Still I have to crack open all three boxes, you know just to make sure everything was there. Off the bat these look like really good kits. Its hard to tell before I start some assembly but at first glance they look good, much higher quality than the kits being produced by the original owners of Wargames Factory. 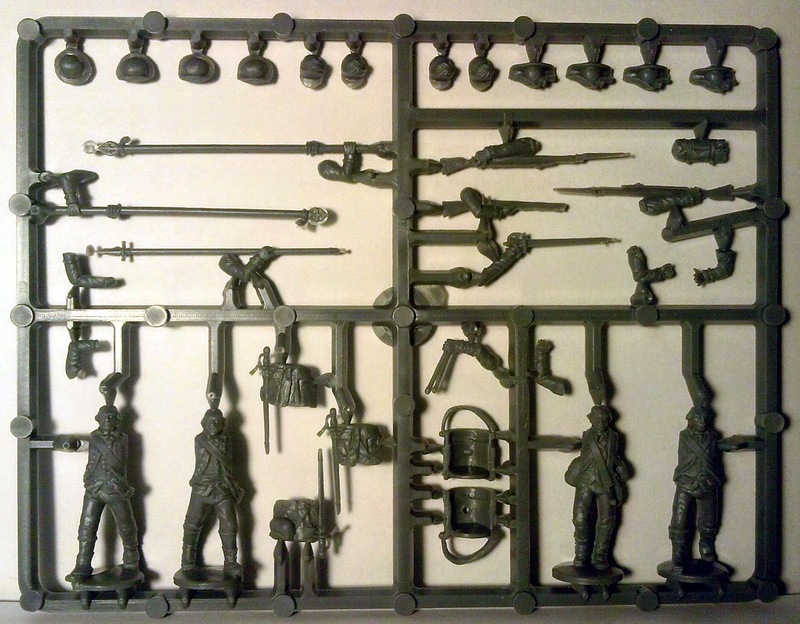 Inside are two sprues of infantry, one command sprue and a sprue of bases. 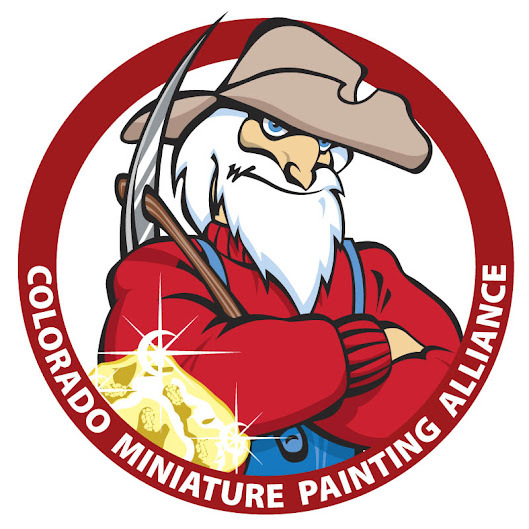 As they say enough for 30 miniatures. 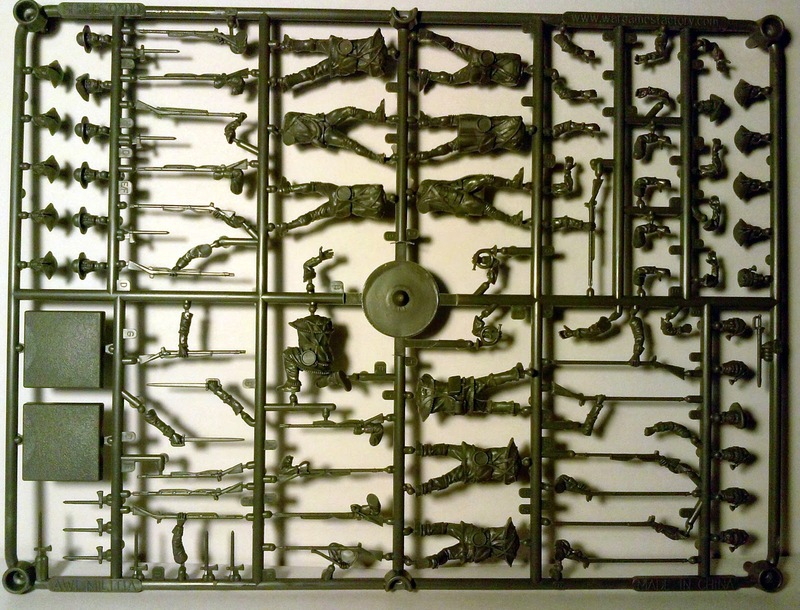 Like the British box inside are two sprues of infantry, one command sprue and a sprue of bases. 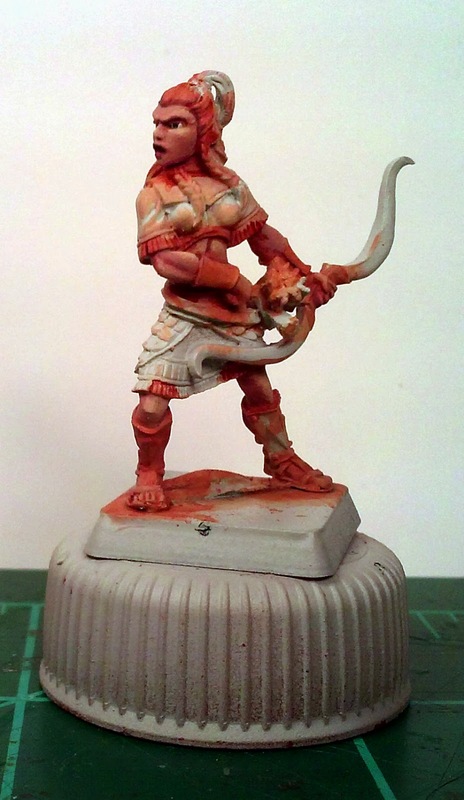 Again enough for 30 miniatures. The mix in this box is a little different. 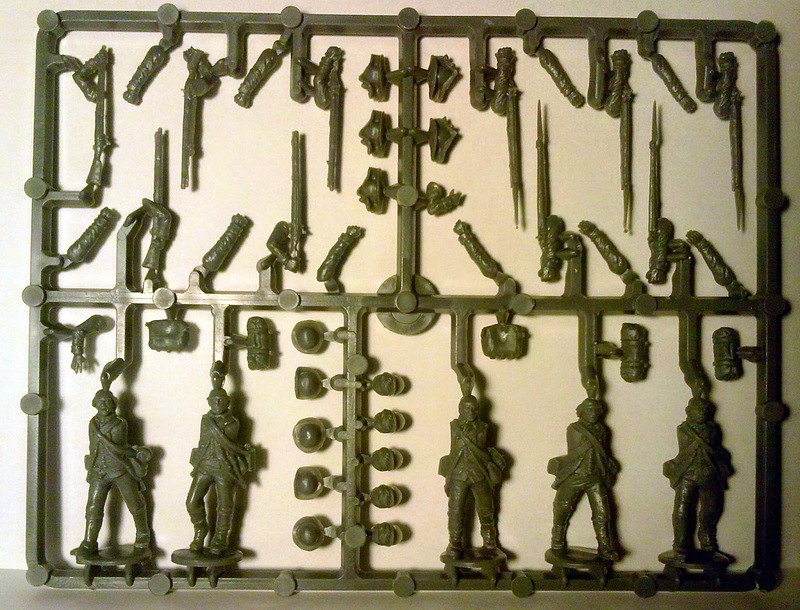 Inside are three sprues of infantry and a sprue of bases. 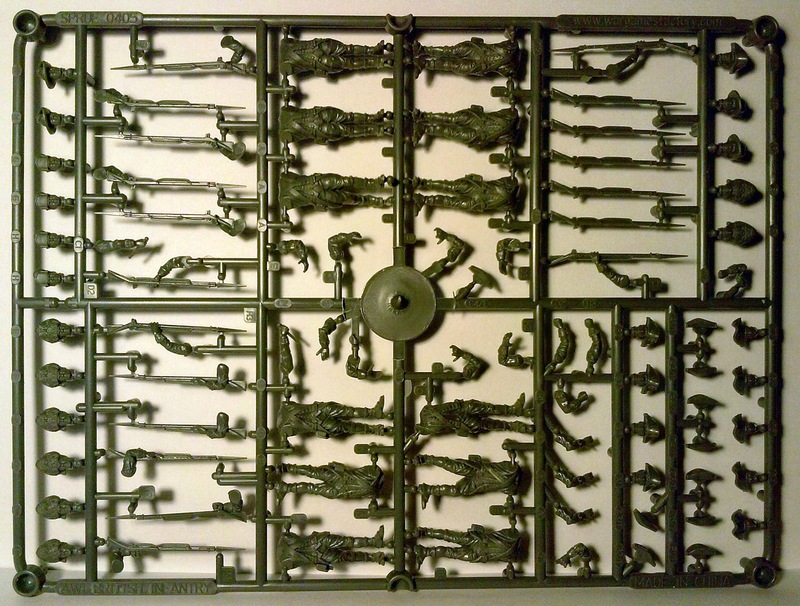 Again enough for 30 miniatures but no command to go with them although there are a couple of horns on the sprues. 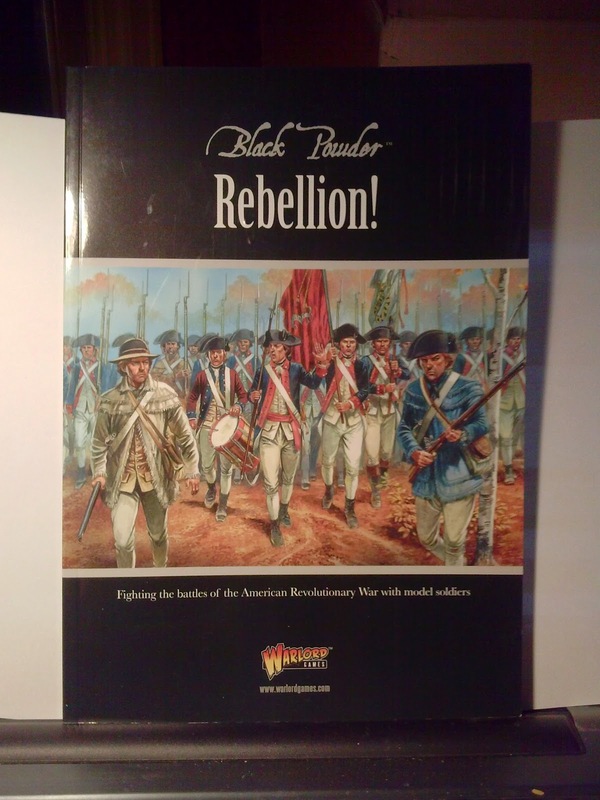 Along with the minis came a copy of The Rebellion by Warlord Games. 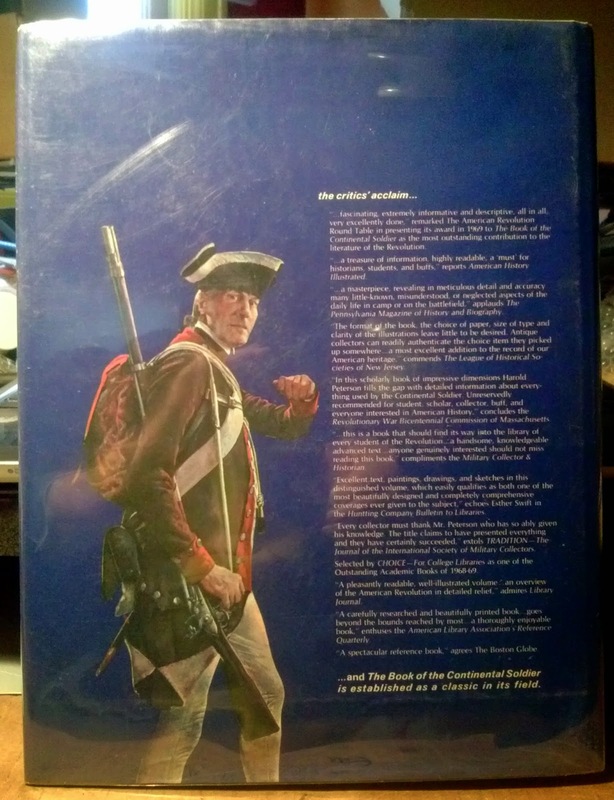 While I'm not sure if Black Powder will be the ruleset I want to use, the historical information in the book is worth the price of admission. 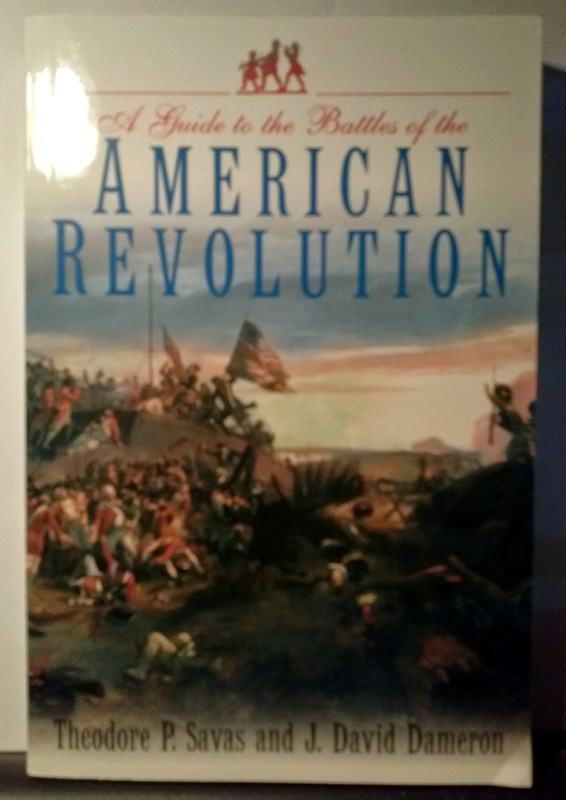 I received a book from Amazon as well; A Guide to the Battles of the American Revolution. I think this will be a great companion book to go along with the Greg Novak books. I'm looking forward to digging into this one. Sorry for the poor picture on this one but its late on Thursday night and I'm not going to re-do it!